The American Fine Arts Festival (AFAF) was established in 2003 by Vladimir Agilin with the objective of promoting musical education and fostering the study and understanding of classical music. 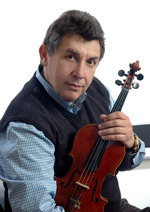 Vladimir Agilin is a life-long educator, who attended the Tchaikovsky State Conservatory in Moscow prior to becoming a violinist with the Russian State Symphony Orchestra and later performing with the “Moscow Virtuosi” Chamber Orchestra. The American Fine Arts Festival is currently run and administered by Art & Music Unlimited, an educational outreach association founded by Mr. Agilin in 2001. Russian born violinist Vladimir Agilin founded the American Fine Arts Festival in 2003 in order to foster the art of music performance and the study of classical music. Mr. Agilin received his early musical education at the Moscow Central Special Music School, and later studied at the Tchaikovsky State Conservatory in Moscow, under M. Pitkus, U. Yanklevich, and M. Gleizarova. Without the generous contributions of our patrons and friends, the American Fine Arts Festival cannot continue its mission to provide appropriate performance venues for young musicians and to encourage greater involvement by young people in the field of classical music study and performance. The American Fine Arts Festival (AFAF) is currently seeking funding for its educational and concert programs, including the 2012-2013 Festival, which is currently scheduled for March-June, 2013. Auditions for the 2012-2013 Festival will begin in December, 2012. AFAF’s current source of income, which is limited primarily to recital fees, is allocated directly to meeting the costs associated with the running and operation of the Festival. Our main expenditures include rental fees for audition and performance venues, travel costs for AFAF staff, audition and competition judges’ fees, competition prizes, marketing and advertising materials, as well as other various administrative costs. The AFAF is actively seeking to develop a partnership with a corporate or government sponsor to help defray costs associated with the running of the Festival. For more information on AFAF’s 2012-2013 Season, projected operating costs, or any other questions pertaining to contributions and sponsorship opportunities, please contact Vladimir Agilin at (732) 671-2831. If you are interested in volunteering for the 2012-2013 American Fine Arts Festival, please contact Vladimir Agilin at (732) 671-2831. If you would like to let others know about our AFA Festival, check this space for printable flyers and posters – posting these on bulletin boards in your local community or music school or sending them to fellow music teachers who might be interested in our Festival is always appreciated. The American Fine Arts Festival, Vladimir Agilin, Founder and Director, decided to celebrate its third anniversary with a Spring Gala Concert, bringing together the most accomplished participants from this and all the past years of the festival. The result of this heartwarming extravaganza at Weill Hall last May 27th presented thirty talented youngsters of assorted ages, shapes and colors (some wore attractive national garbs – bright red bows and wraps for their big day). … It was gratifying to encounter so many vividly individualistic musical personalities in one sitting, which resoundingly confirmed the old saying “Variety is the Spice of Life.” … Best of all, this concert sounded like a wholesomely well prepared and unvarnished affair. Not one piece we heard gave me the impression that these kids were given a hothouse kind of behind-the scenes Ivory Tower prodding by the teachers and parents. Everyone seemed to love their music and enjoy playing it: a rare circumstance. Congratulations to the American Fine Arts Festival for its outstanding contribution to music education. Your wide variety of programs are to be commended for their excellence and creativity. I have attended several of your winners’ concerts in Carnegie and Merkin Halls and the German Cultural Center and have been very impressed with the very high standards of performance. You offer a great service to rising young classical musicians. My name is Andrew Zhu, and I performed Liszt’s Concert-Etude “Gnomenreigen” for the American Fine Arts Festival at the Weill Recital Hall on May 23, 2008. I would like to thank you for the opportunity you have given me to play at Carnegie Hall, and for congratulating me after my performance. This recital was an invaluable experience that I will keep with me for the rest of my life. It has given me much confidence, and will drive me to achieve more success. It has also fueled my interest enthusiasm to pursue further piano studies. I am very impressed with the work and the high artistic quality of the American Fine Arts Festival. It is an invaluable and memorable experience for aspiring young musicians to play in such a prestigious venue as Weill Recital Hall, Carnegie Hall and German Cultural Center in New York. My students had such an inspiring and uplifting experience to perform there and listen to other wonderful performers which included pianists, string players and vocalists. Bravo to the Director and all the staffs for such an organized and wonderful event! Thank you, Vladimir Agilin, for another fabulous production of the American Fine Arts Festival at Carnegie Hall! This annual event is an opportunity of a lifetime for promising young musicians – and an extraordinary incentive for each to strive to achieve their best. Your generous attention to each participant ensures that each enjoys participating, and any nerves about performing in such an auspicious venue are quickly dissipated. What a confidence-booster! You attract outstanding young talent to the Festival through your tireless efforts personally conducting auditions in multiple locations and individually greeting each student. Your enthusiasm and dedication will doubtless make this Festival a “must attend” on everyone’s calendar as the public gets wind of this gem of a musical event. Without exception, we heard excellent performances and exceptional musicality throughout the 2006 American Fine Arts Festival performances. The opportunity to play at Carnegie Hall as a participant in the American Fine Arts Festival was truly an amazing experience. It gave me confidence to believe in myself as a performer. You clearly recognized musical developments that I had achieved since you heard me at my audition, and I was so encouraged by your personal interest in my achievements. I am very grateful for all your hard work and dedication. For the past two years, our daughters, Allison Costello (15) and Casey Costello (11), have participated in a number of the recitals organized by the American Fine Arts Festival. Every one of these events proves to be a tremendously educational and entertaining experience for us. For every winners’ concert, the founder of AFAF, Vladmir Agilin, painstakingly selects the most talented young musicians from various regions and presents them in the most prestigious setting of Carnegie Hall. Dressed in elegant suits or gowns, the performers play the most challenging pieces with such sophistication and artistry as the highly skilled professionals. One can hardly fathom that some of these kids are as young as 7, 10, or 15. As participants, my daughters have consistently been inspired by their fellow performers. They’ve broadened their taste of music and aspired to learn the new pieces they’ve heard at the concert. They find it heartwarming to know that there are other young kids, just like them, working as hard as they can to balance music, school, and other fun things in life. Performing in the AFAF winners’ concerts at Carnegie continues to be one of the highest goals for my daughters every year. They view it as a great honor to be selected by Mr. Agilin and an even greater honor to perform at Carnegie Hall. As they progress through life, I am certain they will look back at these years with gratitude and self-satisfaction; and they will have Vladmir and AFAF to thank for.